Disc golf is a game that has been around for over thirty years, but lately seems to be becoming popular with younger generations in their teens and twenties. I was introduced to disc golf a couple of years ago by two friends that I went to church with. I immediately fell in love with the game, even though I was not that good. There are three reasons why I love disc golf; it’s competitive, active, and cheap. To me, it’s one of the perfect games to introduce to the boys at the Joy House. Our residents in the boy’s home have varying abilities and likes. 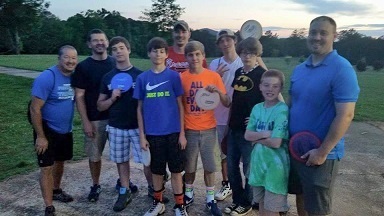 Disc golf helps give us something that is competitive, active, easy to learn and not too intimidating because all of the boys are typically on level playing ground as most of them have never played before. The first time I took the guys to play disc golf, a couple of them saw woods and walking and thought for certain they were going to hate it. After playing our first round the boys were hooked, especially when some of our less active residents beat a couple of the more active residents. The boys and I have enjoyed playing at various public parks including Sequoyah and Oregon, especially when we get to meet up with some friends and mentors that join in on the game. The greatest blessing has been the relationships that have formed between the boys and Christian mentors who have been willing to invest their time and energy in encouraging our residents while playing the game, or during a post-game chat over ice cream.